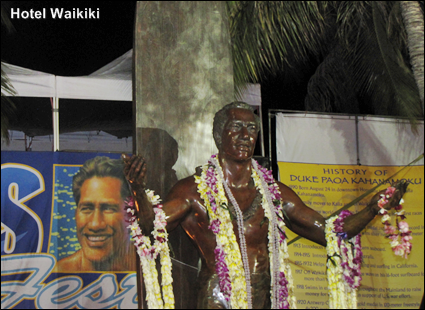 Final day for the Duke's Oceanfest. And yes, the resolution is bad. Definitely not the fault of the camera man. I tell you. Finally after struggling with insomnia for the past few weeks, I slept for 20 hours last night. Ah, insomnia, how you have robbed me, of days, of years. The only thing that even approaches being as much an irritation is loading pics and posts to Blogger. 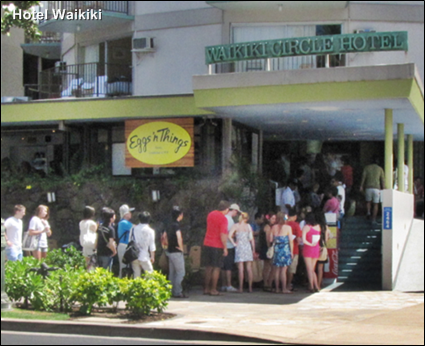 Across the street, even at 10 o'clock there's a line out the door and into the street at Eggs n' Things. This is the newer second Eggs n' Things location. 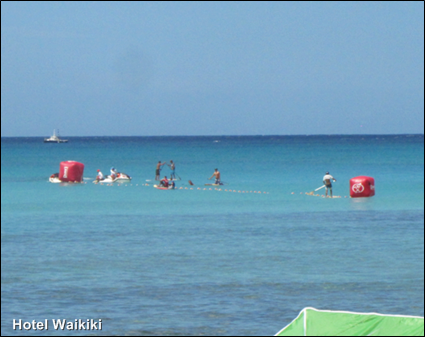 Bouys and lane rope set up for the water races. Funny thing happened, as soon as I got home, there was a burst of rain. It lasted only for a few minutes as it's a summer rain. Later in the year we'll get snow as usual. Wink. At any rate, 'tis not the season yet for the doom & bloom people. 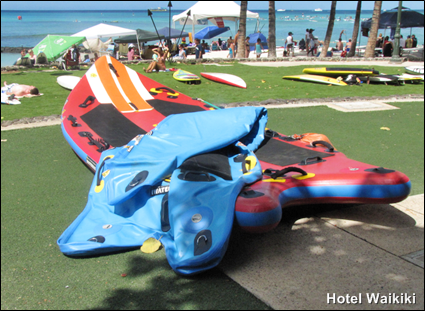 Hard to see by the pic, but this inflatable raft was 5-feet wide across, and say, 12-feet long from bow to aft. At the start of the month, I noticed 2 people who park next to me in the basement garage had moved out of the building. One person owned a moped and a regular car so I definitely know he moved. The other person I assumed moved out. That is, he could have simply sold his car, but since I haven't seen him since, all bets are that he did move out. But then, even though 'we' live in the same apartment building, there are literally months that go by when we don't run into each other in the elevator or the lobby. Also, some people's batteries run out. Nothing you could do there. And they for you neither. I've been living in the same apartment building for almost 24-years with 12 apartments per floor and 12 floors. Essentially a vertical neighborhood sardine can style but not nearly as cozy since there are neighbors who I say hello to exuberantly as if they were a puppy and then there are neighbors who I just look straight ahead when I pass them in the common areas of the building. I forget, either last year or earlier this year, a lady who lived on the same floor as me passed away. I remember her because she was saying the doctor's gave her 2 months more. This was just after she came outta the hospital, and happened to see seating on the steps of the building and inquired with a generic, "How are you doing?" Then a month later, she had to have another operation on a different organ. She complained that the second operation was giving her pain all the live long day, but the doctors or whomever refused to grant her request for some stronger pain medication. Remember, by now she had only a month left on the ticker. Nothing scientific, but I suspect the objective of second operation was just so the beancounters could get as much money as they could squeeze from her health insurance. Anyways, a month passed and the lady passed away. About every so many years a long time tenant kicks the bucket as well and the neighbors inform me about it. We actually could form a blog community all to our own, but that wouldn't work because the majority of the long time tenants do not have computers. The larger truth of the matter is that the people on the Internet know more about me than my neighbors in the same building as we never discuss the kinds of things that I post on the blog. It just wouldn't work the same in real life. It seems a few floors apart is a greater gap to bridge than thousands of miles over the Internet. Earlier today, I voted at the polls in Hawaii's primary election for Senator and Honolulu mayor. 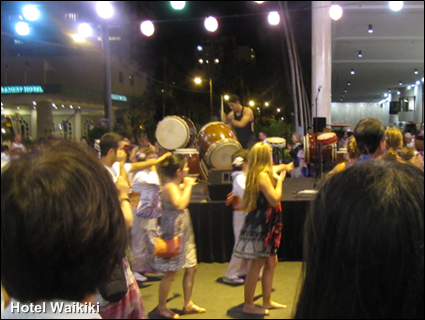 Later, stopped by the Waikiki Bon Dance. It use to be held in a large parking lot. 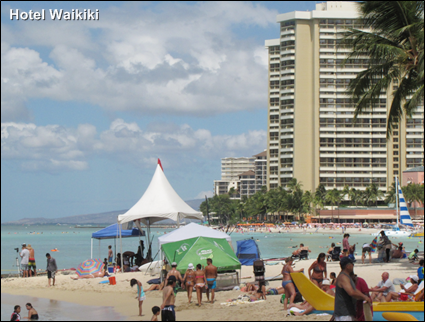 The Waikiki Bon Dance was then probably the largest bon dance on the island by square footage. 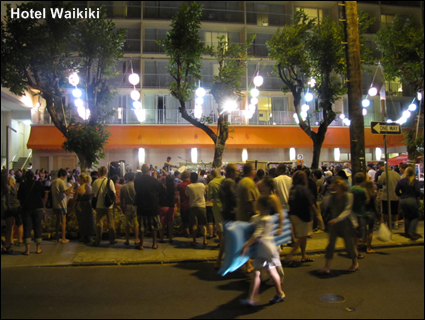 From what I know, the hotel that owned the parking lot was sold and the new owners discontinued the annual bon dance which had become a yearly tradition around my neighborhood. 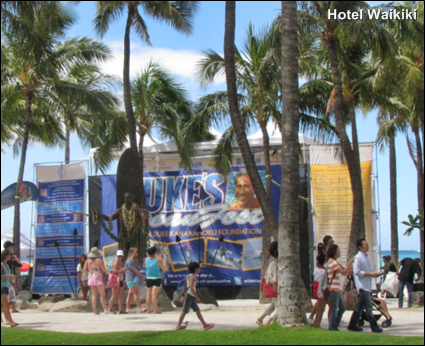 Today the Waikiki Bon Dance is held in front of the Pacific Beach Hotel, that's the hotel which has the restaurant with the huge aquarium (oceanarium) in it, but the space that the dance is now held on is the size of a postage stamp without the paper envelope. 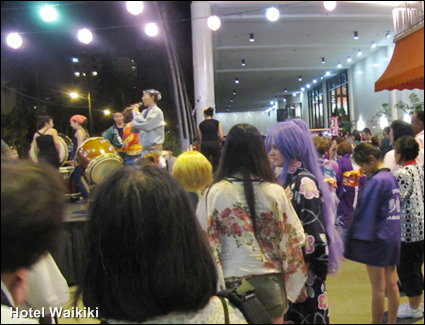 There's minimal space for the stage and the dancers, much less, room for the people watching the festival. 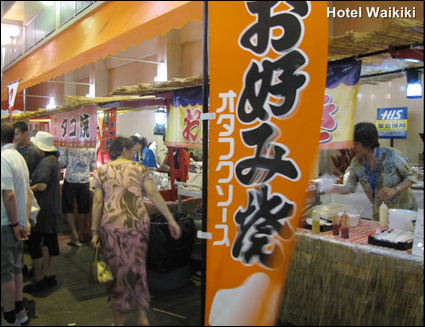 But then, the bon dance is held Friday & Saturdays for three consecutive weekends, whereas, the other local bon dances, only for a single weekend. 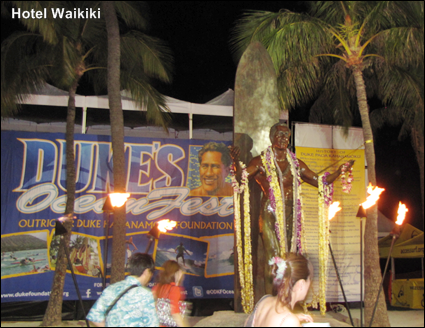 Unfortunately, this Waikiki venue lacks the pièce de résistance in the food department .... teriyaki strips of meat on bamboo skewers, that's ubiqutious at local bon dances. On my nightly stroll to the beach, I had to walk around a car which the driver had pulled off and parked on the driveway, on the part of the driveway that would be part of the regular sidewalk if the sidewalk ran through. Perhaps, the occupants whom were still inside planned to talk for an hour to each other just to take a break from tweets. Well, not quite. Instead, the driver walked around to the passenger side and opened the door for his date. Haven't seen that in a while, and all I can say is that the mars lander couldn't have been any more impressive, save if the lady, picked up the dinner and drink tab, which seldom ever ever happens. Later at the beach, and something fellow smokers could relate to .... I realized that I had forgotten my lighter dang it, and no my lighter's name isn't dang it. But to make the most of things, I lit my cigarette on a tiki torch. Thusly, if you, too, ever forget to bring your lighter to the beach. You now knows how to light your cigarette, but this only works at nights, of course, since the tiki torches are off during the day. At any rate, the most stoopidest thing .... the Hawaii court (or judge) has allowed a mental institution patient to attend community college classes unsupervised. The nutcase had been attending classes supervised. Which is senseless enough since there exists online courses. Acquited by insanity in 2010, the patient stabbed two people on a hiking trail in 2009 while he was naked. One of the victims, 18 times. 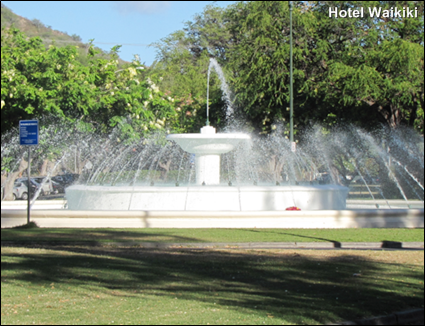 People use to throw soap suds into the water. I think at nights they shut off the fountain.